Welcome to week three of this year’s blog hop! 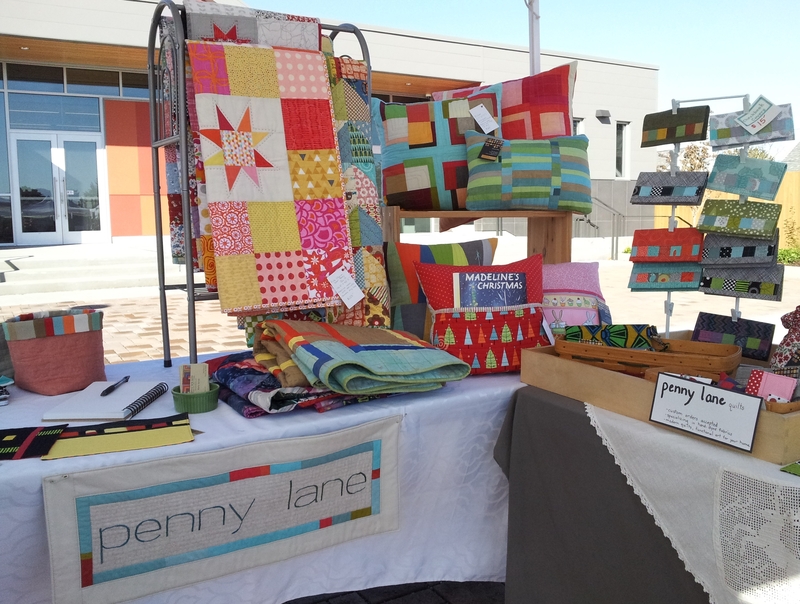 Last summer, I decided to start a small business to sell hand made, quilted items and Penny Lane Quilts was born. (I live on Penny Lane, hence the name.) At this point, I sell at a few arts and crafts fairs, some local shops and I do some custom work, as well. 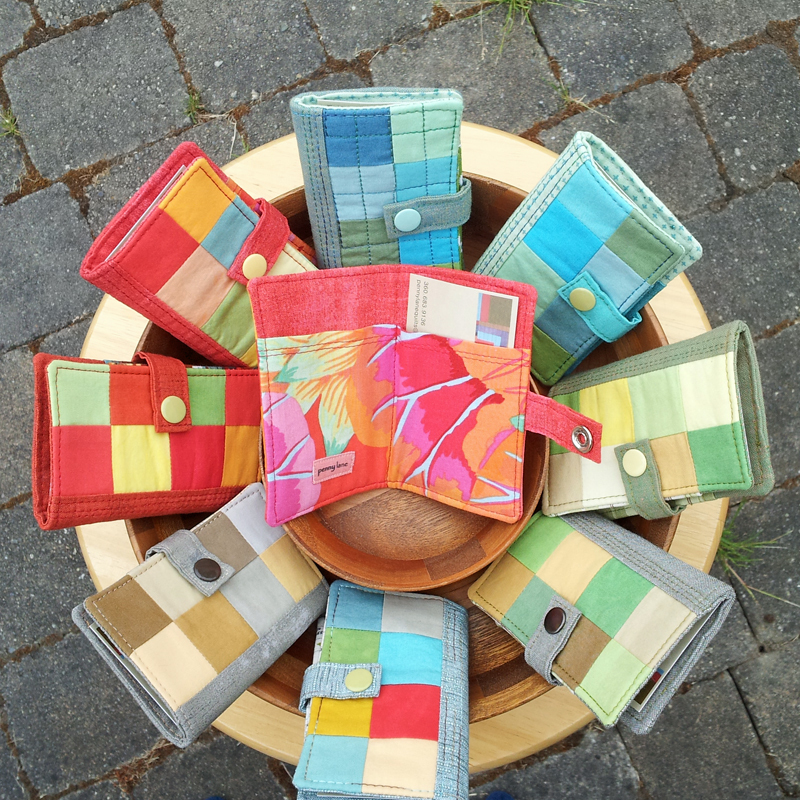 My tagline, “modern with a hint of vintage” refers to creating modern quilts and products on vintage machines. I’ve been quilting for over twenty years, so I guess I’m a little vintage, too! I live in beautiful Sequim, Washington. The Olympic mountains greet me each morning and the nearby waters of the Strait of Juan de Fuca are all that separate us from Victoria, B.C. 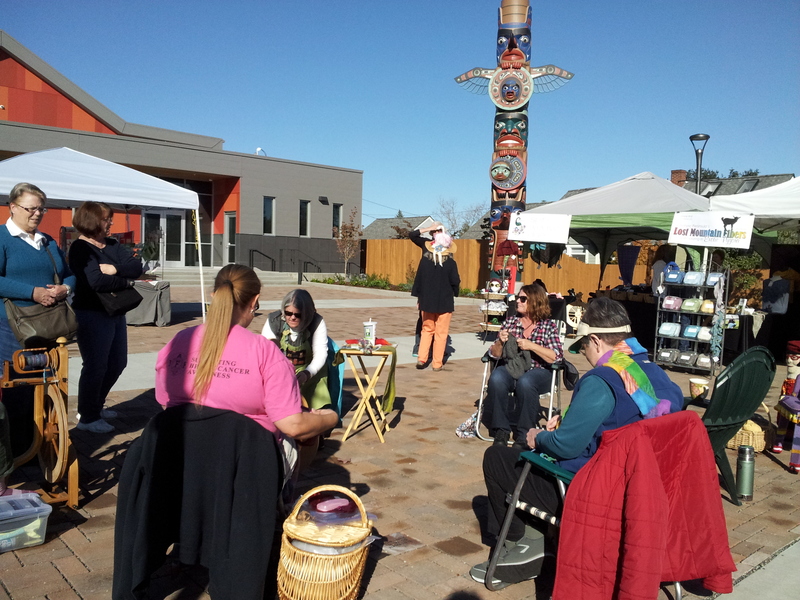 My quilting adventures began over 20 years ago when a friend suggested taking a class at our local quilt store. 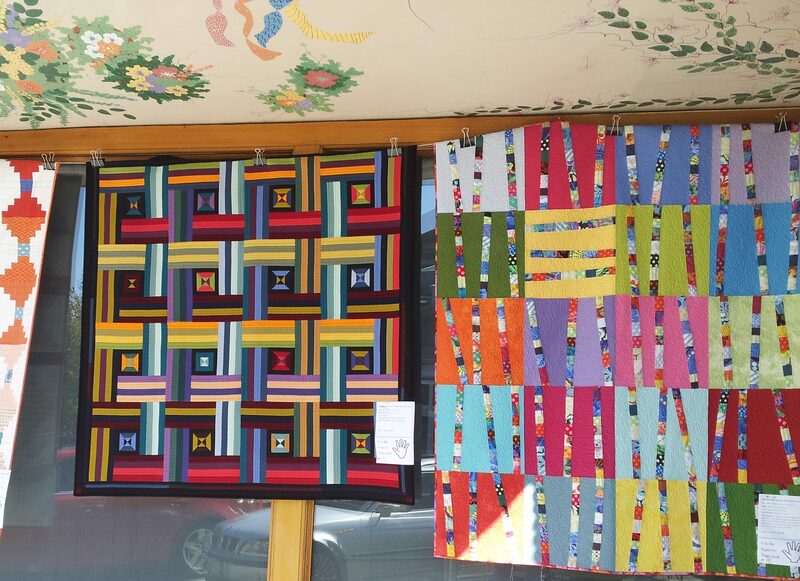 That shop has long disappeared, but my love of quilting has only grown. 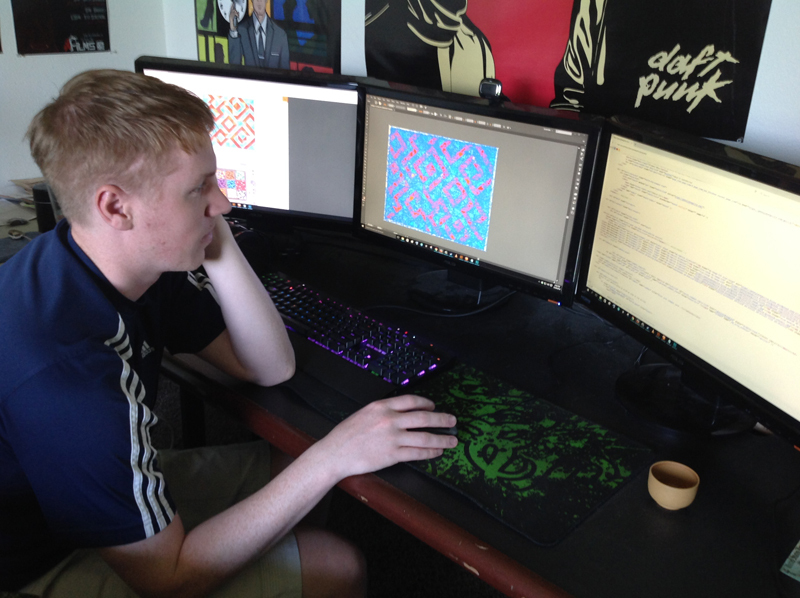 Over the years I learned a variety of skills as I created traditional quilts. 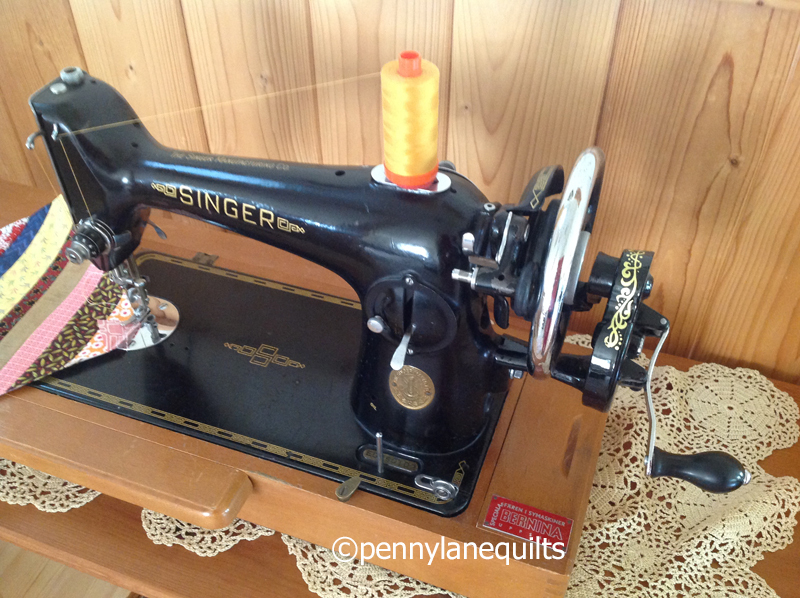 During this time, I also collected vintage Singer sewing machines including a few treadle and several hand crank machines. But a few years ago, I began creating improvisational quilts and dyeing my own fabrics and my quilting took on a more contemporary look. 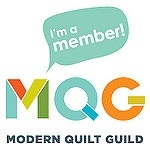 I joined the Modern Quilt Guild in 2013 to connect with other quilters interested in taking a modern approach to their quilting. 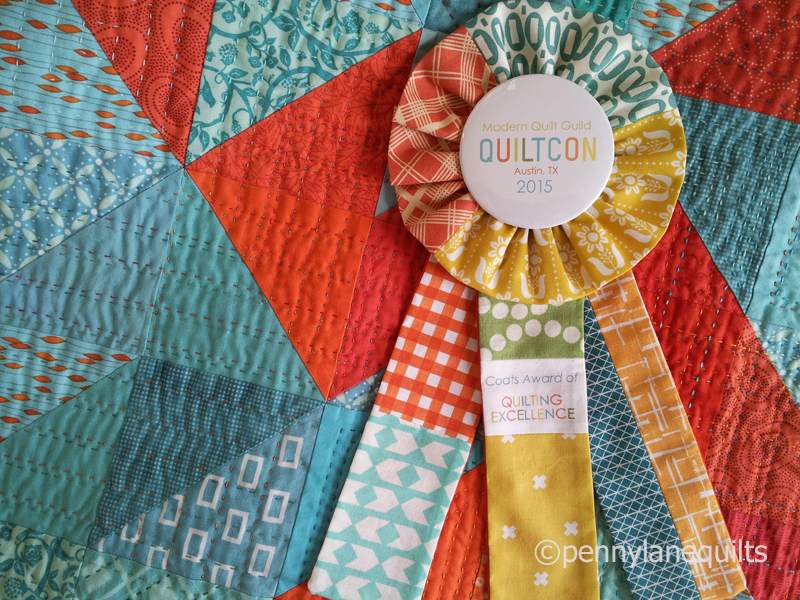 At QuiltCon2015, I was so excited to be attending my first big quilt show and convention. I was doubly thrilled to have two of my quilts juried into that show and to see them displayed in the company of so many wonderful quilts. I was shocked, thrilled and a little overwhelmed to discover that my quilt, Coral Reef, had won an award. I missed last year’s show, but I’m registered and excited to be attending QuiltCon East in Savannah next February! Baby quilts are always fun to make and I try to keep a few on hand to sell or donate. 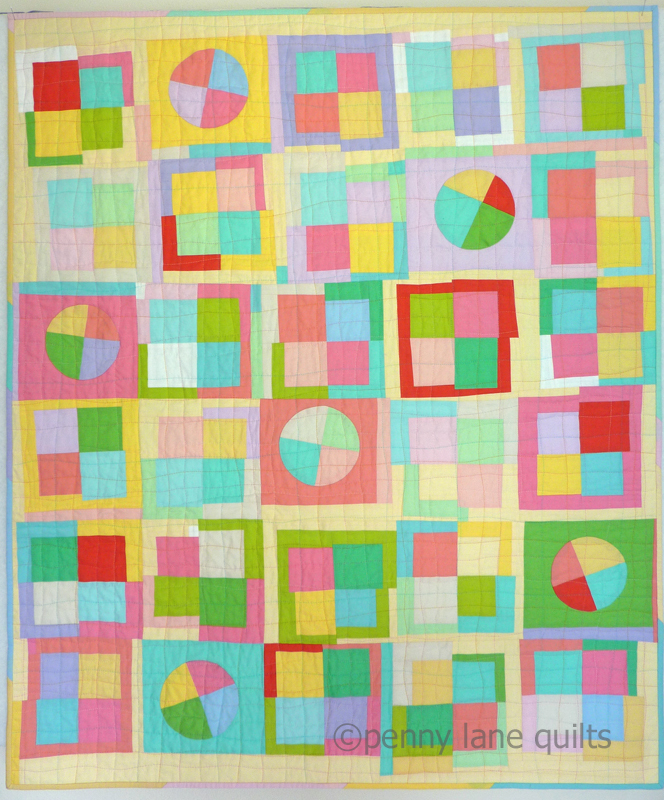 The size is just right for machine quilting and I enjoy simple patchwork piecing. Here is one of my favorites. There are lots more photos of my projects in the galleries, including household items and personal accessories. Go to the menu and check them out! If you are interested in following along here, I’ll share my process, my current projects and maybe even some helpful tips. Blogging tip: For technical advice, do an internet search. It works ALMOST every time! When that fails, ask family and friends. The advice and feedback that I received from my hive mates and mentors was invaluable! I am so grateful to you all. Many thanks to my son, who created the blog’s new header! Quilting tip: There are MANY ways to achieve your desired result. Do some research and then discover what works best for you. Maybe you will come up with an original way that works best of all! I can play the accordion, although I don’t very often. Flamingos seem to collect at my house. Sometimes I live in a horse trailer. A question for you: I love hand work…quilting, applique, English paper piecing, etc. Do you love to slow stitch, too? If so, what’s your favorite type of hand stitching? If not, I’d love to hear your favorite technique. PRIZES!!! The blog hop is supported by our wonderful sponsors, with lots of giveaways each week. Visit our wonderful mentor and host, Yvonne, to enter! I hope you’ll visit the fellow bloggers from our hive this week, and show them some encouragement, too! Many thanks to our mentors who gave us so much valuable assistance and guidance! Visit the other hosts to find the rest of the new bloggers and the chance to win some great prizes on their sites, too!